A solid swimming pool cover looks innocent enough when you put it on. But after the first rain, it turns into an ugly, messy, slimy monster that inhabits your backyard all winter long ! Swimming pool covers that are solid and drape into the pool allow rainwater to collect on top...along with dirt, leaves and debris. The result is a mess that requires frequent pumping, maintenance and a heavy-duty cleaning before you can open your pool each summer. This mess can be hazardous, too. A child or pet wandering onto a regular swimming pool cover can become trapped as water rushes to the point of depression, and slippery algae makes escape difficult. A LOOP-LOC Safety swimming pool cover is different ! 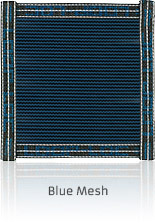 It's made of a fine, strong mesh that allows rainwater to pass right through. Dirt and debris blow away, so the cover always stays dry and neat looking. It's designed to hold to the exact shape of your pool with stainless steel spring and brass anchors that fit flush with your deck when the cover is not in use. Obviously, a dry, taut swimming pool cover that never needs pumping out is a lot safer for children and pets to be around. And LOOP-LOC swimming pool covers are so durable and so well made that they come with a 15 Year Prorated Warranty ! That's why it's smart to insist on a LOOP-LOC cover for your pool this year! END THE MESS IN YOUR BACKYARD ! Unlike solid waterbag covers, a LOOP-LOC requires no pumping, scrubbing or heavy maintenance. And it's much lighter in weight than typical solid vinyl covers, so putting it on and taking it off your pool is a snap! A Perfectly Beautiful Fit Every Time. LOOP-LOC's exclusive Computer Aided Design assures a perfect, custom fit for any shape or size pool. A LOOP-LOC always stays tight, clean and beautiful on your pool - unlike saggy, unsightly solid waterbag covers! From a simple square, to this complex installation, LOOP-LOC can manufacture a custom cover with the perfect fit for any pool or spa. And a LOOP-LOC cover will blend beautifully into any backyard decor, with your choice of standard spring green or optional black, blue and gray designer colors. Every LOOP-LOC Cover comes with a 15 Year Warranty. Now LOOP-LOC's legendary ultra-strong mesh is even better! It's made with a new denser weave that blocks virtually all sunlight but still lets rain and melting snow easily drain through. It's the perfect choice for customers who want less light and debris in their pools, but still want the one of a kind protection of the only pool cover proven safe and strong enough to support an elephant! We use extremely high-strength, non-corrosive 302 grade stainless steel springs for superior weight-bearing capacity. Chafe strips are manufactured with exclusively virgin material - not "regrind," which tends to stain decking. The standard size covers listed below are Black and come with concrete deck hardware. If you have a wood deck or brick deck, please call us for additional hardware needed. If you need wood deck hardware or if you need a custom size, please call us for more information. Hardware - Necessary quantities of hardware are represented in all prices, which includes Standard Brass Anchors, Regular Stainless Steel Springs, Vinyl Tubular Spring Covers, Metal Installation Tool and a Storage Bag. Find the "SIZE OF YOUR POOL" in the chart below to see various info on it. All Info below applies to all colors of Mesh covers. Loop Locs are sold by the size of your pool. All covers will come 2 feet larger than the pool size listed for proper overlap. 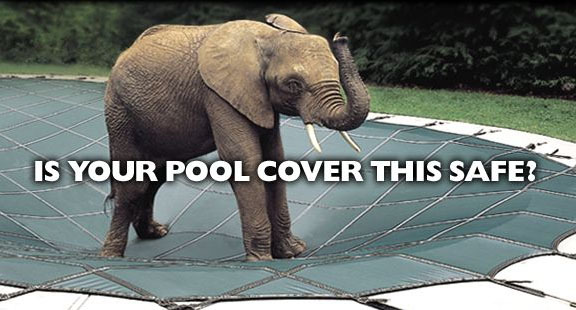 Order the cover that corresponds to the size of your pool. Black, Blue, Gray or Tan compliment your backyard's landscaping design while providing safe, secure protection for your pool through the rough winter months ! Designer Color Black can be ordered at the bottom of this page. If you wish to order a Designer Color, Click on one of the color swatches below to see the prices and order that cover. Please note: Actual Colors may vary slightly due to die lots and differences in monitor colors. If you want an actual sample of the color material please call us at 1-800-876-7647 and we will send you one. The Covers listed below are Loop Loc Stock Covers and are Designer Black in color. If you wish to order one of the other Stock Designer Colors, please click on the color of your choice above.